Interactive self-guided tours through the Piraso client and a great way to guage the tool's capabilities. Before we move on with the interactive demonstration, You should first do the following requirements. Please install the Piraso client application on your machine. Before downloading, be sure to have JDK 6 Update 13 or later. Get the piraso client application and start with the live demos. Provides you a documentation guide on how to use Piraso Client. 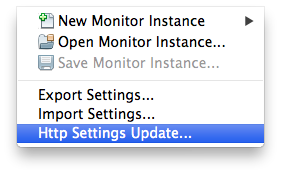 1 Open Piraso client and click on File > Http Settings Update menu. 2 Copy the import link below. 3 Provide the import url and click on Update. Success! You are now ready to start with the live demonstrations. These live demonstrations shows how Piraso monitors for log4j application logging. All Logging Levels Log4j log entries on all logging levels. Debug Logging Level Log4j log entries on debug logging levels. Error or Warning Logging Level Log4j log entries on error or warning logging levels. Selected Logger Log4j log entries only for a selected logger with info logging level. Third Party Loggers Log4j log entries only for org loggers with trace logging level. This also shows the log entry stack trace. These live demonstrations shows how Piraso monitors for sql executions. SQL Statements Demonstrate how Piraso capture sql executions. SQL Result Sets Demonstrate how Piraso capture sql executions with result set data. SQL Method Stack trace Demonstrate how Piraso capture sql executions with method stacktace. The demo project is also available from Github.